In effort to improve relations between police and communities, White House has announced new standards for federal programs in the aftermath of the Ferguson protests. President Barack Obama said Monday that he would ban federal transfers of certain military-style equipment to police departments as part of a broader administration effort to build trust between law enforcement and communities. With tensions still simmering after several police killings of unarmed African-American men, the White House released a blueprint detailing dozens of recommendations for improving policing and announced that an executive order would halt the federal provision of some military gear to local law-enforcement agencies. Prohibited equipment will include tracked armored vehicles, weaponized aircraft, bayonets, grenade launchers, large-caliber firearms and some camouflage uniforms. The administration announced more stringent controls for other equipment, including unmanned aerial vehicles, some specialized firearms, explosives and riot gear. Law-enforcement agencies requesting such gear will be required to seek the consent of local government and ensure that personnel are trained to use the equipment. 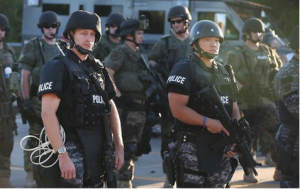 Mr. Obama said police use of such equipment can send the wrong message by intimidating and alienating local residents. The president last fall defended the program created by Congress in the 1990s to allow law-enforcement agencies to obtain excess Defense Department supplies, but said his administration would develop new rules and improve oversight. A working group created by the White House conducted a months-long review and found a lack of coordination among federal agencies and no consistent standards for police departments seeking equipment. Richard Beary, president of the International Association of Chiefs of Police, said the administration admirably tried to strike a balance between police departments’ needs and community concerns. Still unanswered, he said, is how the new standards will affect the way law-enforcement agencies get essential equipment. Most of the proposals aren’t expected to be controversial, and some have been discussed by law enforcement for years. On Monday, the administration announced a grant program to provide funds to some local law-enforcement agencies that commit to implementing the task force’s recommendations.